Project managers are a pivotal part of any organization and can be part of almost any industry. As change agents, project managers set goals, identify measures of success, and encourage team members to collectively accomplish tasks within an organization. They often work with upper management to understand the overall strategy of specific projects, and to determine the tasks and timeline of completion. 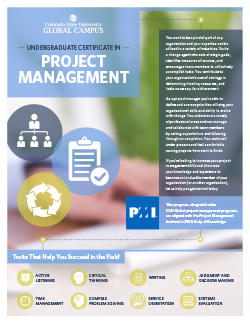 A Graduate Certificate in Project Management is a stand-alone, transcribable certificate that proves your proficiency in the field. The certificate you earn at CSU-Global is recognized nationally by educational institutions and professional organizations. Apply knowledge of project leadership theories/practical application in organizations. Apply effective written communication and research skills. Examination of management control, monitoring, and value methods. Demonstrate critical thinking skills for effective analysis in decision-making. Assess costs, risks, and benefits of total quality management. Employ the knowledge and skills needed to identify and solve organizational problems using a systematic decision making approach. Demonstrate advanced principles of project management, business analytical skills, and organizational development knowledge to execute and manage projects. terms of successful project management. Communicate and demonstrate the importance of ethics, quality, testing, metrics, reliability, and validity in relationship to project success. Outline and explain the additional requirements and considerations that should be considered when managing international and multinational projects.